In nuclear poker, who's betting on small reactors? 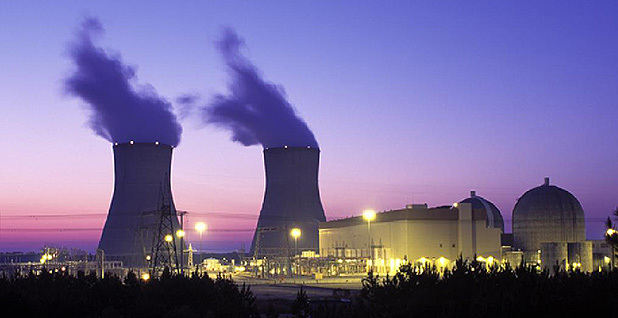 The Vogtle Electric Generating Plant near Waynesboro, Ga. Photo courtesy of the Nuclear Regulatory Commission. If there is going to be a second act for nuclear power in the United States, it may begin with a plant containing a dozen small, factory-built nuclear reactors that is adept at multitasking. It must be cheap enough to compete against natural gas-fired electric generators and safe enough to locate near other industries in major population centers. It must have the potential to create thousands of high-technology American jobs by grabbing a chunk of an expanding nuclear power export market for an energy-hungry world that the Commerce Department estimates to be worth $500 billion to $740 billion over the next decade. To compete effectively, the plants that produce the electricity must be reliable, long-lived and relatively simple and deliver a product to help 195 nations comply with a climate agreement made in Paris that went into force in November. It must restrict rising levels of carbon dioxide and other man-made emissions to 1.5 to 2 degrees Celsius by midcentury, which will require new energy sources to produce almost no CO2 emissions. This may sound like plot points for a "Mission: Impossible" script, but the plans to carry it out are already unfolding in Washington before the Nuclear Regulatory Commission (NRC); among Department of Energy laboratories; and in Portland, Ore., where a company called NuScale Power LLC has been working on the idea since 2000. Nothing involving commercial uses of nuclear energy has ever been easy. Its first act began in World War II, where the idea for a uranium-powered, commercial electricity plant grew out of efforts to make an atom bomb, and then led to an effort to harness nuclear energy for a propulsion system for a submarine. Today, nuclear power produces 60 percent of the emissions-free electricity in the United States, and it may hold the keys to making solar and wind energy more available on the grid. Act 2 for nuclear begins not with a war, but with what Michael McGough, the chief commercial officer of NuScale, calls a "poker game," where the pot opens with a billion-dollar ante. The reward for winning would be a document that says the NRC — reputedly the most demanding nuclear regulatory body in the world — approves the design described in 12,000 pages of documents that NuScale has submitted after an expected 42 months of scrutiny. Existing nuclear power plants are getting old, and some of the companies that made them have been pushed to the financial sidelines. For example, one U.S. pioneer, Westinghouse Electric Co., was purchased by the Japanese company Toshiba Corp. in 2006. Since then, $6.3 billion worth of cost overruns on two large nuclear plants it is building in the United States is forcing Toshiba to withdraw from the nuclear business. Nonetheless, there are at least 30 corporate strategies for small, modular nuclear reactors to replace them being hatched in the United States and around the world. If it is the first to be certified by the NRC, NuScale will be able to build, sell and demonstrate its peculiar capabilities. Counting a $217 million grant from DOE, by the time that process starts, NuScale will have put roughly $1 billion on the table. NuScale already has a buyer, the Utah Associated Municipal Power Systems, a network of small power plants extending across nine Western states. The Idaho National Laboratory (INL), a DOE facility, has already agreed to site the plant on its 890-square-mile reservation near Idaho Falls. Ninety-six percent of NuScale is owned by Fluor Corp., an Irving, Texas, engineering firm with deep pockets and a 60-year involvement with commercial nuclear power. According to McGough, Fluor will be the international deployment contractor for the plants, but NRC certification must come before anything else happens. "It's one thing to talk about it. It's another thing to actually build it and do it," he explained. 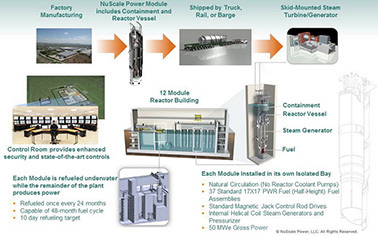 An illustration of the NuScale power plant with 12 operating reactors. Graphic courtesy of NuScale Power LLC. There is no one "it" that the NuScale plant is designed to do. Its appeal will come from carrying out multiple missions that the current generation of nuclear power plants can't do well. What the "NuScale Diversity Platform," containing up to 12 50-megawatt water-cooled nuclear reactors, does on a given day will be dictated by the highest price it can get for electric power. The existing fleet of nuclear reactors, many of which can produce 1,000 MW, are most cost-efficient when running close to 100 percent of their rated power. That makes competing on a grid with solar and wind power expensive because they rapidly fluctuate and nuclear power is supposed to help balance supply and demand by what is called "load following," preventing blackouts by making up the difference when winds die down or clouds pass over. That means the plant, with its high overhead and capital costs, must sometimes operate at only 10 percent of its power, or even give away its power to stay in its backup position on windy days or sunny afternoons when solar power is so plentiful that electricity prices can go negative. But in that situation, the NuScale plant can stay profitable by switching the power from some of its reactors to more lucrative chores like desalinating water. Others among its "12 pack," McGough explained, could use their electricity for splitting hydrogen out of water, creating an end product that could be stored and used for fuel-cell-powered cars or to sell to companies that make fertilizer. Still others could be designated to serve microgrids, or circuits designed to protect vital industries, hospitals or military bases from regional power outages. "This gives you a tremendous amount of cycling capability," explained McGough. Developing more power shifting could also help solve one of the electric power grid's biggest problems, which is that there are, at the moment, few cost-effective ways to store excess electricity. If there were, solar and wind power might compete against fossil fuels without government subsidies, lowering the nation's overall costs of electricity. The challenge, as McGough and other NuScale officials sometimes put it, is to make the next nuclear power plant "a good neighbor." Theirs and other pending designs for new nuclear reactors feature "passive" safety systems that are intended to prevent the most feared accident, which is a loss of cooling water when pipes break or outside power losses make emergency pumps fail. During Japan's Fukushima Daiichi disaster in March 2011, a tidal wave led to meltdowns of three reactors and a massive release of dangerous radioactive materials. The NuScale reactors would sit below an underground pool that uses gravity to supply cooling water. They are housed in a structure strong enough to contain radiation, withstand airplane crashes and meet current NRC earthquake standards. In case of an accident, NuScale plants are designed to shut down automatically and cool off using convection and other natural forces without the need for outside power or additional water. Current NRC rules require nuclear power plant owners to monitor a 10-mile emergency evacuation zone around a nuclear power plant by creating an alarm system, areawide evacuation plans and other measures to protect neighbors against inhaling radioactive debris sent aloft from a meltdown. NuScale's plan is to convince the NRC that its system is so safe that there is no danger of a meltdown, so the emergency requirements should only extend to a plant's fence line, which McGough says will enclose a site of about 250 acres. That would lower expenses and allow NuScale plant owners to use existing coal-fired power plant sites located in or near cities, sites that have good connections to transmission, water and transportation that are being abandoned as electric utilities move away from coal. Ed Lyman, a physicist and senior scientist at the Union of Concerned Scientists, which has campaigned against nuclear power's safety problems for years, thinks that NuScale's plans may have some champions at the NRC because they feature light water cooling and traditional enriched uranium fuel — systems that regulators are familiar with. But he asserts that existing safety rules should not be relaxed to accommodate supposedly safer plants. "I just think it's the most bizarre and terribly wrong-headed approach," he said, adding that "there's no real market for this reactor" and predicting their power will be more expensive than the electricity produced by larger, conventional nuclear plants. A cluster of new reports from DOE laboratories dispute that. A recent joint study by scientists at INL and the National Renewable Energy Laboratory (NREL) notes that the most lucrative product that new nuclear plants might deliver cheaply is heat for a variety of industrial processes, from corn milling to making steel. At least nine industrial sectors have a big need for it, and most get their heat now by burning fossil fuels. Industries are the third-largest source of U.S. greenhouse gas emissions, and supplying their heat needs from clean fuel sources could substantially help reduce them, explained Mark Ruth, a project leader at NREL. He said that using "nuclear-renewable hybrid" energy systems could help both nuclear power and renewable energy make more money in local and regional markets. One example studied the costs of using nuclear heat in Arizona to switch from making steam to generate electricity to making heat to desalinate brackish water for irrigation when wind power drops electricity market prices too low. Another example in Texas looked at the economics of switching from selling nuclear electricity into a slumping electric market to providing heat to a factory that uses it to make synthetic gasoline. Both hypothetical situations made money. "The cost opportunity seems to be there," said Ruth, who added that utilities also need to be thinking about how future hybrid combinations could give utilities a hedge against a future rise in natural gas prices or a carbon tax on greenhouse gas emissions. Some reports describe the future hybrids as "co-managed systems" between plants that could be found in large industrial parks. That could be a question for the Trump administration. "A lot of what we look for in the hybrid energy space is better utilization of our energy resources: How can we do more with what we have?" said Shannon Bragg-Sitton, a senior nuclear engineer at INL who also worked on the concept. She was referring to both existing nuclear plants and plans for new ones, such as NuScale's, that could emerge in the mid- to late 2020s. At the moment, operating nuclear power plants are growing fewer and older. In 2013, the United States had 104 operating commercial nuclear reactors. Since then, five have shut down, three of them facing expensive mechanical problems. In July, seven more nuclear plants warned the NRC they could shut down before the end of their current operating licenses. While a few states, led by New York, have tried to help the competitive situation of nuclear power plants by giving them subsidies previously enjoyed by renewable energy, the costs of operating nuclear plants have gone up, and their income continues to shrink. If this continues, DOE estimates half of the nation's current reactors could be facing retirement before 2030, leaving a widening gap in clean energy production.